Flipkart Oppo Days Has Started & Fliplart is Offering Very Good Discount On Oppo Smartphones Including Oppo K1. Here is Super Deal if You are Planning To Buy A Smartphone From This Sale. Oppo is Offering Flat Rs.15300 As Guaranteed Buy Back Program. What is Guaranteed Buy Back ? Flipkart guarantees a buyback price when you exchange this phone with Flipkart for a newer phone With in 8 Months , That Means In This 8 Months If You Want to Exchange This Phone Then Flipkart Will Give You Guaranteed Rs.15300 As Back. So After Guaranteed Buy Back Total Price Will Be Just Rs.1690. 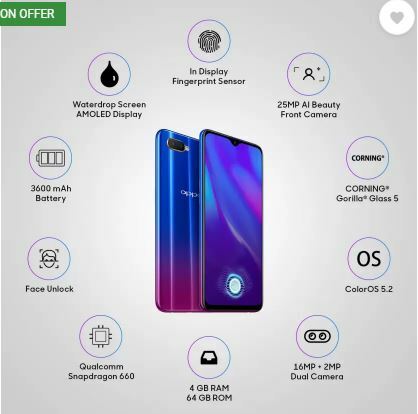 How To Buy Oppo K1 In Just Rs.1690 With Guaranteed Buyback ? 6. Enjoy The Smartphone !! How To Claim The Buyback Money ? 1. The Buyback Policy is non-transferrable. 2. Original phone must be returned in a working condition with no major dents/damages to avail buyback. 3. There will be a reduction in buyback value if original box, charger or accessories are not returned.